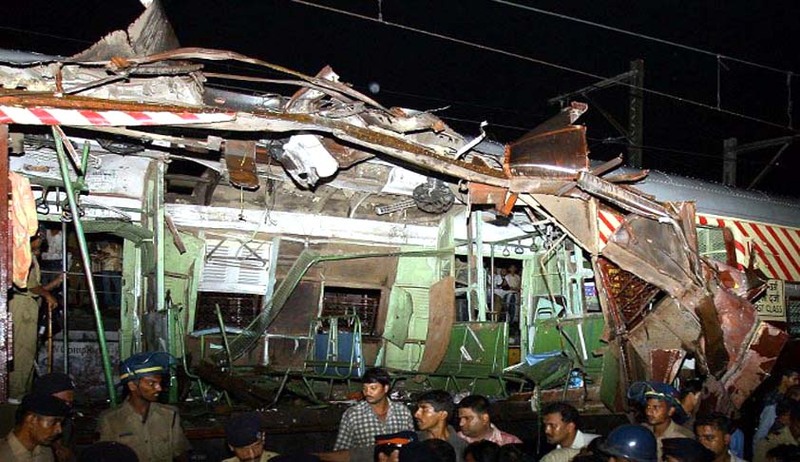 Nine years after the 7/11 Mumbai trains blasts that killed 188 people, a Special MCOCA Court has reportedly awarded death sentence to five convicts and sentenced seven others with life imprisonment. Those awarded the death penalty are: Kamal A Ansari, 37, Ehtesham Siddiqui, 30, Faisal Attaur Rehman Sheikh, 36, Asif Khan alias Junaid, 38, and Naved Hussain Khan, 30. The seven other convicts awarded life imprisonment are: medico Tanvir A Ansari, 37, Mohammed Sajid Ansari, 34, Sheikh Mohammed Ali Alam Sheikh, 40, Mohammed Majid Shafi, 30, Muzammil Sheikh, 27, Soheil Mohammed Sheikh, 43, and Zamir Ahmed Sheikh, 36. Special Judge Yatin D. Shinde had reserved his order on sentencing on September 23. It had concluded hearing arguments for quantum of sentence, with the prosecution demand of awarding death penalty to eight out of twelve convicts, calling them “merchants of death”. On September 11, the Special Court had convicted 12 out of 13 accused, having been found guilty under various sections of IPC, Explosives Act, Unlawful Activities Prevention Act, Prevention of Damage to Public Property Act and Indian Railway Act. They were also found guilty under Section 3 (1) (i) of MCOCA, which attracts capital punishment. The convicts were alleged to have links with banned SIMI. After finding them guilty, Justice Shinde had permitted the defence lawyers to examine witnesses to highlight the mitigating circumstances in the case. The defence lawyers had then contended that the convicts were merely acting as pawns of the mastermind, Azam Cheema, member of Pakistan based Lashkar-e-Taiba. They had examined nine witnesses to bring to the Court’s notice that the accused had undergone reformation, which should be considered as a mitigating circumstance. Among the witnesses were family members of the convicts, Nadeem Akhtar, a fellow inmate and another accused in the 13/7 Mumbai serial blasts, a university teacher lodged in Arthur Road Jail and Arun Ferreira, a writer and social activist, who was acquitted on charges of being involved in Naxal activities. On September 21, Advocate Yug Chaudhary, representing the convicts had referred to the injuries and brutalities inflicted on the then-accused, during police custody. He also brought to the Court’s notice that they were kept under solitary confinement and were forced to undergo narco-analysis tests performed by a bogus doctor against whom a police report was registered. Opposing consideration of these circumstances, Special public prosecutor Raja Thakare contended that the money of honest taxpayers should not be spent and the Government should not be burdened for the upkeep of these convicts. The chargesheet filed by Anti Terrorism Squad (ATS) in November 2006 had named 30 accused, out of which 17 are absconding. The ones absconding are 13 Pakistan nationals, including Azam Chima, member of Pakistan based Lashkar-e-Taiba. Two years after this claim by the ATS, the Mumbai Crime Branch arrested Mohammed Sadiq Israr Sheikh who claimed that his organization, Indian Mujahideen, was behind the blasts. The Court had then allowed Sadiq’s examination. However, Sadiq later claimed that he gave his confession was made under duress. In June, 2007, the accused had approached the Supreme Court challenging Constitutional validity of MCOCA. The Supreme Court had then ordered a stay on trial. The stay was vacated on April 23, 2010 and examination of witnesses resumed. In the trial that continued for eight years, the prosecution examined 192 witnesses, including eight Indian Police Service (IPS) and five Indian Administrative Service (IAS) officers as well as 18 doctors. The defence lawyers examined 51 witnesses and one person was called as a court witness. The Trial concluded on August 19 last year.